HBO Asia’s wildly imaginative and visually stunning fantasy thriller comes to SHUDDER, the first time an Indonesian created and English speaking TV series will be available to watch in the UK. Blending the magic and horror of the films of Guillermo Del Toro, with the action and Eastern spiritualism of the greatest of Asian genre cinema, HALFWORLDS is a high velocity, intense viewing experience created and conceptualised by rising genre filmmaking sensation Joko Anwar. 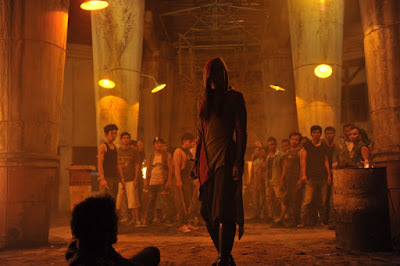 Set in present-day Jakarta, HALFWORLDS Season One lifts the veil on a parallel world of bloodthirsty creatures from Indonesian mythology who have lived amongst humans for centuries. They are known simply as "Demit" and have been carefully concealed by a powerful family of mortals. As the day of a mysterious supernatural event known as the Gift draws near, Sarah, a street artist, finds herself caught between the worlds of human and Demit. Once the Demit find out who she really is, and what she must do, the delicate balance between the two worlds will be shaken forever. With art and animation by comic artist Chris Lie (GI Joe) and shot in Batam and Jakarta, HALFWORLDS offers a slick, dark and action-packed journey into the unknown. Too full on for other streaming platforms, SHUDDER is proud to present visionary Mexican director Emiliano Rocha Minter's WE ARE THE FLESH which pushes extreme cinema to its breaking point. Zoe Bell stars in this visceral and bruising tale of a woman brought to an underground lair and forced to fight other innocent victims for the amusement of unseen spectators. This sci-fi drive-in classic follows teenagers Steve (Steven McQueen) and his best girl, Jane (Aneta Corseaut), as they try to protect their hometown from a gelatinous alien life form that engulfs everything it touches! A scientist battles a malevolent spirit in this mean and lean haunted house chiller. Twisted and twisting in its tale, PROXY unveils the darker side of parenting as a young woman gradually realizes nothing in her life is as it appears after a vicious attack. The title says it all... almost... as a man peels away his own layers in the pursuit of love. From Joko Anwar, the fevered mind behind HALFWORLDS comes a dark Indonesian survival thriller and a race against time. A shy high school student moves into a housing complex with her family and is tortured by visions of her tragic past. From the director of RINGU. A police detective learns twin brothers possess mental powers that they use to force people to harm themselves in this taut and quirky genre gem. A murderous woman springs into action when her victims come back as zombies in this energetic and knowing Spanish comedy horror.